Summer is a crazy time for us…spending lots of time down the shore, get togethers with friends, BBQs…the usual warm weather fun. I sometimes don’t know when/where I’m coming and going. And I’ve been realizing that committing to recipe swaps can be a big challenge during all of this because of those reasons. Plus, I usually forget when the deadline dates are! Whoops. We had a nice little “shake up” earlier this week with the earthquake, and now we’re preparing for Hurricane Irene to sweep through this weekend. Yeah, craziness is a great way to describe these past few days. So when I realized I needed to make a recipe submitted by Melissa (Lemons & Love) for our Italian swap, and I needed to do it ASAP, I had to get creative with what I had. I was down at our shore house, faced with many ingredients that I needed to use up before they went bad. I immediately remembered a quick and easy dip that resembled Melissa’s, but was perfect for what I had in the house (and the garden!). This dip is GREAT for when you need something thrown together super fast, or when you’re too lazy to do much else besides combine 3 ingredients 🙂 The addition of fresh garden basil is perfect…try not to use the dried stuff if you can help it. Preheat oven to 375 degrees. Combine all ingredients in baking dish (make sure you get as much juice out of the tomatoes as you can!) and bake for about 15 minutes. 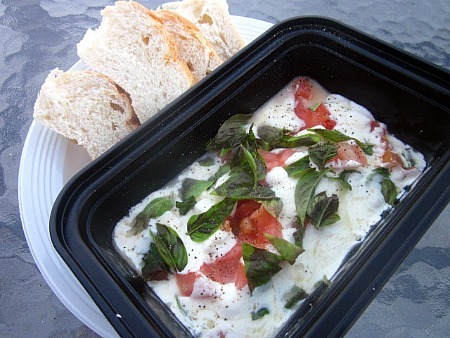 Serve immediately with sliced Italian bread to keep the dip from getting too “wet”. You can stick this under the broiler for a few minutes after it’s done baking if you like. This entry was posted in appetizers, dip, Italian, mozzarella, QuickAndEasy, tomatoes. Bookmark the permalink. This sounds (and looks) amazing. I’m drooling. Definitely printing it out now to make soon. What a great idea! Love this take on a caprese salad! A great treat. Stay safe as Irene comes through! Hope you and your family are safe, Melissa. Scary times there. My daughter just headed for the hills today (lives in VA Beach) — the stress is enough to make me want to eat a batch of this dip myself!!! Good luck this weekend chica! This dip looks amazing. If I had a bowl of this in the house…I’d be set during the storm.